These three easy steps can make the difference between living with on-going graffiti or living free of it. 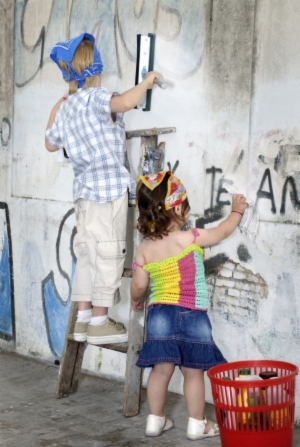 The City certainly would like to live free of graffiti, so the Clean Covington Campaign was formed in July 2009. The campaign includes business support and sponsorship, citizen support and volunteerism, and efforts from the city like education and outreach and enacting a Clean Covington Day. When you notice graffiti, it is very important to record it. Whip out your cell phone or digital camera and take a snapshot of the "tag" and related damage. If you don't have access to a camera you should write the description down and/or draw it if you can. Graffiti does not always happen with spray paint, permanent markers and stickers are also a common form of graffiti. The importance of reporting graffiti (and quickly) is to allow police to discover what types of graffiti are in Covington and notice trends, similarities, or patterns. Police often can tell who has done the "tagging" when they see an image of it. Report graffiti online through Covington Connects. When is the best time to remove graffiti? Immediately after you see it. Recording and reporting the graffiti is step one to the removal process. It is proven that the best method to stop graffiti is to remove it promptly after it appears because taggers don't get to enjoy their work if it is gone so quickly. The city provides free Graffiti Removal Kits to aid businesses and homeowners in removing graffiti promptly. To help residents and businesses remove graffiti when it happens, the City has put together Graffiti Removal Kits with the help of some local businesses: Wal-Mart, Home Depot, Sherwin Williams, and Alpine Markings. To be eligible to receive a Graffiti Removal Kit you must be a Covington resident or business and make a submission through Covington Connects with proof of the grafitti (a snapshot). Graffiti Removal Kits are available by arrangement to be picked up at City Hall. For more information, please contact Communications & Marketing Manager Karla Slate at (253) 480-2402 or kslate@covingtonwa.gov.